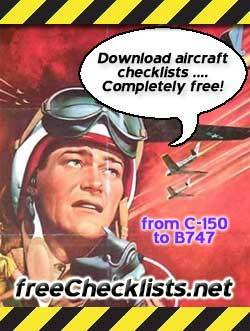 You're welcome to link to www.freechecklists.net to tell your visitors about this free resource. 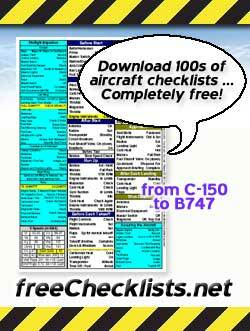 Please link only to www.freechecklists.net and not to any sub-page or resource inside of the site. We've created a number of banners below which you may use on your site. While you ARE welcome to direct link to the banners below, we strongly suggest that you copy the actual .jpg images to your own site. We suggest this because otherwise it is possible that your viewers will not see the banners below since many browsers these days have "ad blockers" that might prevent such linked images from being seen, even if you're just trying to be helpful. Thank you very much for directing visitors to www.freechecklists.net. As you know, this is a non-profit community effort for the betterment of aviation. When the site grows, everybody wins. 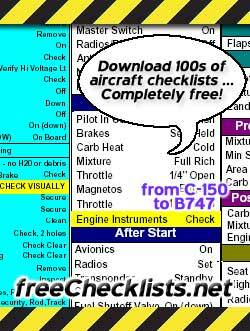 www.freechecklists.net - hundreds of free downloadable aircraft checklists, pilot's notes, weight and balace spreadsheets, and more for Cessna 150s to Boeing 747s. You may use any of the images below on your website!